Harry N. Abrams, 9781419731686, 40pp. Einat Tsarfati graduated with honors from the Visual Communication department at the Bezalel Academy of Arts and Design in Jerusalem. She is a freelance editorial illustrator as well as the illustrator of books for children, including An After Bedtime Story. "Tsarfati (An After Bedtime Story) offers accomplished execution, sureness of line, and restrained, urbane humor. Her story celebrates both imaginative power and the way great imaginations sometimes miss what’s closest to them." "This book is one delightful, imaginative reveal after another, ending with a fabulous double-twist chuckle. The text is simple and elegant, supported by absolutely charming images, and it’s icing on the cake that the illustrations are so internationally inclusive . . . The pages warrant long, wondrous examinations and afford readers almost endless satisfaction in the tiny discoveries awaiting them." "A closing spread undermines her earlier statement about her "boring " parents by depicting them as superheroes. 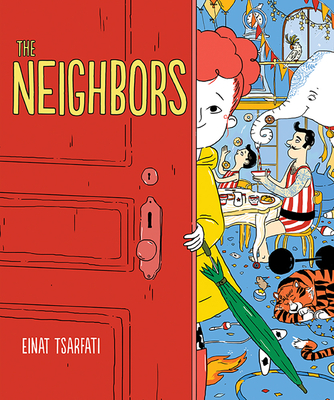 This fantastic twist reintroduces the possibility that anyone might reside behind the neighbors' doors, after all. Delightfully ambiguous and recursive"
"The surprise ending in this zany and imaginative picture book is sure to have young readers going back to reread and look for clues."